Instead of coming home from her missions trip to a welcoming party... Kim reenters America only to face a string of difficult, terrible circumstances. 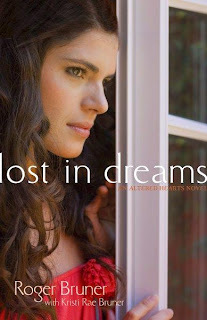 Lost in Dreams by Roger Bruner with Kristi Rae Bruner is the sequel to Found in Translation. To be honest, I found the beginning depressing. Which is how readers are probably supposed to feel...it means we care about Kim Hartlinger and what happens to her. The title also doesn’t seem very fitting. Lost in Nightmares would have been more relevant. I was happy; however, that Aleesha returns as a main character in this book. That was a pleasant surprise! Rob reappears as well. And we finally get to meet Betsy Jo. While things don’t go as Kim planned (going straight to college and majoring in Spanish), God has something even greater in store for her. I won’t tell you exactly what but the aforementioned characters all get to do it together...and it’s ministry...and He uses them to touch people’s lives in a positive life-changing way...how cool is that?!? So even though the book began as a real downer, the middle was interesting. Several different types of conflicts are introduced. I did want to shake Kim and tell her to be more open with her dad, though :). The ending was, ah, quite different than what I had expected. The authors managed to approach Kim’s problem from an angle that hadn’t even crossed my mind. Don’t worry; it’s a satisfying resolution. All in all, Lost in Dreams is a good, clean book and unlike so many novels for my age group, it doesn't have the distraction of teenage romance in it. Team Novel Teen is a group of bloggers dedicated to spreading the word about clean teen fiction. Check out other posts about Lost in Dreams by Roger Bruner by clicking on the links below, and check out www.NovelTeen.com for more information about Team Novel Teen. This sounds like an interesting book! I actually don't read much in the 'teen' genre, so it is great reading reviews about teen books from someone who can view it with maturity and then give an honest, useful opinion. I loved seeing Aleesha back in full force in this second book! I loved what she brought to the story, and her straight-forward talking made me chuckle. Nice review, Alyssa! I love Aleesha's character. And you make a good point about the lack of romance. I'm glad there wasn't any. And that there wasn't any in the first book. It was refreshing.